How do I connect Klipfolio and Desk.com? You can set up a connection between Klipfolio® and your Desk.com data to display your help desk metrics on a dashboard. What options do I have for visualizing my Desk.com data? Desk.com pre-built data sources: Data sources provide the foundation for Klip® building, so we suggest you create a data source as a first step (before building Klips™ and adding them to your dashboard). Our pre-built data sources focus on the most sought-after Desk.com data and are found on the Service Connectors page, available from this link or from your list of data sources. When you select a service connector from this page, the data source for that service is automatically added. Regardless of whether you choose pre-built, custom-built, or a combination of both, before you can start building Klips and dashboards you need to connect to Desk.com data in Klipfolio. How do I connect to Desk.com data in Klipfolio? To connect your Desk.com data to Klipfolio, you will need your Desk.com username and password as well as your site name. To get the right data from Desk.com, you use your Desk.com site name in the queries provided by Klipfolio or in your own query when building data sources. How do I find my Desk.com site name? Log into your Desk.com account. Your site name can be found in the URL at the top of the page in this location: https://<yoursite>.desk.com/agent. Use your site name in your Desk.com query in Klipfolio. How do I add a Desk.com pre-built or custom-built data source? Navigate to the Service Connectors page in Klipfolio and choose Desk.com from the list. Select a pre-built data source from the left section of the Pick a Data Request page. Alternatively, if you want to create a custom-built data source, click Create a custom Desk.com data source. Enter your Desk.com username and password and click Next Step. If you are creating a custom-built data source, edit the Query URL further to return the data you need. Refer to the Desk.com API documentation for details. How do I create a Desk.com data source from scratch? 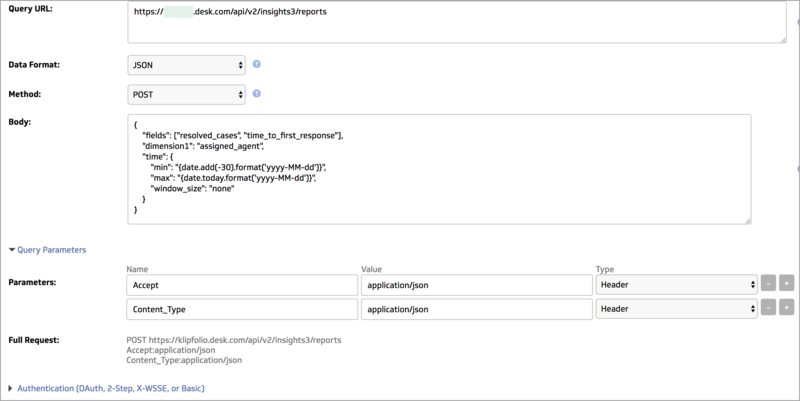 Refer to the Desk.com API documentation to discover more data requests. When you are happy with your query, click Submit, and then save and name your new data source. You're now ready to use it to build a Desk.com Klip. If you selected Create a Custom Desk.com Data Source and not a pre-built query from the list, you will need to set up a POST request to get data with a date range. At Query URL enter the base URL of your Desk.com query. At Body, enter your Body parameter using fields and dimensions that correspond to your base URL. Here is a body parameter that you can use to get you started. Refer to Desk.com API documentation to learn more. To see how the query parameters is configured in Klipfolio, see this screenshot. How do I create a Desk.com custom Klip?